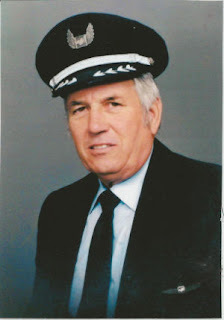 Notification of the passing of WA/DL pilot Captain Bill Finley, age 82. Captain Finley hired on with Western 07-22-1957 and retired with Delta, based LAX & SLC. Services will be held 10:00am Thursday, March 14, 2013 at the First Baptist Church in Brady TX. Interment will follow with military honors at Gooch Cemetery in Mason. The family will receive friends this evening from 6pm to 8pm at the First Baptist Church in Brady. BRADY — Funeral services for William R. "Bill" Finley, 82, of Brady will be held at 10 a.m. Thursday at the First Baptist Church in Brady, with the Rev. Frank Banda officiating. Burial will follow in Honors Gooch Cemetery in Mason. Visitation will be held from 6-8 p.m. Wednesday at the First Baptist Church in Brady. He died Sunday, March 10, 2013, in Fort Worth. He was born May 16,1930, in Aurora, Colo. He was a pilot for Delta Airlines and a member of the First Baptist Church in Brady. He served in the U.S. Air Force during Vietnam. Survivors include his wife, Patsy Finley of Brady; son, Jim Finley and wife Charlotte of Fort Worth; daughter, Becky Finley; and five grandchildren. He was preceded in death by a daughter, Sarah Finley. William R. "Bill" Finley went to be with the Lord on March 10, 2013. Bill was born May 16, 1930 in Aurora Colorado. He attended Colorado A&M where he received a degree in Forestry Entomology. He then entered flight school at Goodfellow Airforce Base in San Angelo Texas. There, he met his beautiful wife Patsy Shearer, they were married for 58 years. He became a flight instructor, a Vietnam War Veteran and a pilot for Delta Airlines. He then retired to his ranch in 1985 after a 33 year career in Aviation. With his wife Patsy, he took his family on a fantastic life journey, living in Japan, California, Colorado and then Texas. He was always busy with his many projects including his cows, and almost always some kind of building project. He loved his grandchildren, spending time teaching them things only a grandfather can. He had a special relationship with his daughter Becky who would often help him with tasks around the house and at the Ranch. All his life he had a passion for those in need and where he could share his passion for God and his belongings. More than once he brought teenagers to live with his family while they needed help. He also took up Missionary work in Ukraine and Mexico, collecting clothes and money to build churches and schools. After his retirement, he became a Baptist Minister and traveled around central Texas preaching and helping those in need. Bill taught his children and those around him to love God, to have passion in your life, to work hard, to believe in yourself and your abilities, and to give of yourself and your possessions to those in need. Bill made a difference. He leaves this world a better place because of what he did and how he treated those around him. Bill is survived by his wife Patsy; children Becky Finley and Jim Finley and his wife Charlotte; sister Mary Lou Finley, his grandchildren, Ashley Finley, Amber Finley, Austin Finley, Nathan Mahand, and Ryan Mahand. He is preceded in death by his daughter Sarah Finley and brother Richard. The family requests that in lieu of flowers, donations may be made to the William R. “Bill” Finley Memorial Account at the Commercial National Bank, P.O. Box 591, Brady, Texas 76825.